Pointers to use in the classroom! 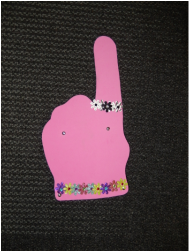 Pointers can gain attention, help children focus, and are fun and very useful for the teacher. Finger puppets (that go along with themes are great) Finger tips at Halloween time can be purchased very cheap (You can also use bugles, and they can eat them). Glue any toper to a stick! 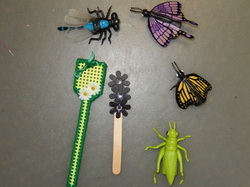 Insect finger puppets make great pointers, the flyswatter was a magnet on my grandma's refridge when I was little. 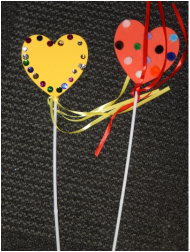 pencil with fun toppers for themes and holidays work great. These are all pens or pencils with fun toppers. Anything can be used as a pointer. 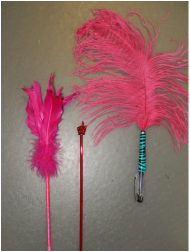 I made a pen into a pointer by gluing a large feather to it. 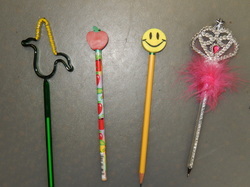 The one in the middle is a cheap 1.00 pointer from Dollar Tree, they are easy for students to use. 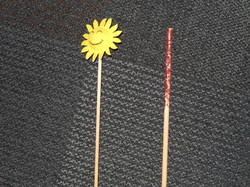 Drink stirrers are also good for little fingers and hands, just add a topper. These are cheap foam items from Hobby Lobby I just added bling to them. 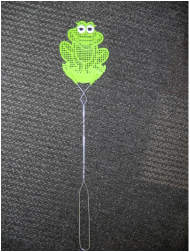 This is a frog flyswatter, and I just added eyes. Get a garden glove or a winter glove/mitten. Stuff it with tissue or Wal-mart sacks, glue all but the pointer finger down. 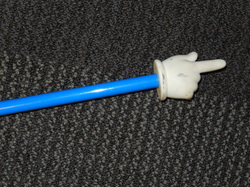 Secure onto a dowel rod with a rubber band. You can paint the rod or cover in foil, or fun tape. 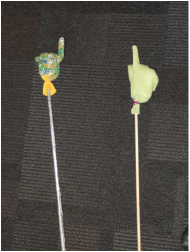 you can choose any antenna toper for a pointer, or roll a dowel rod in glitter at the top. 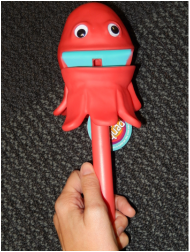 This is a normal pointer you can buy from any educational store, and dollar tree now has them! 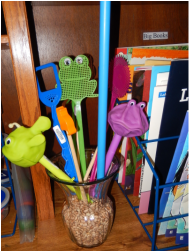 You could buy several for students to use in centers! 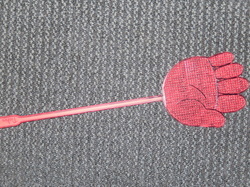 Flyswatter in the shape of a hand. 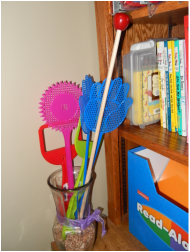 Wal-Mart usually sells really fun flyswatters at the beginning of summer for really cheap. I also use this to play word wall games with my students. This is the container I keep all of my small pointers in, my large tall pointers are kept on a traveling plastic rack so they can move with me around the room. 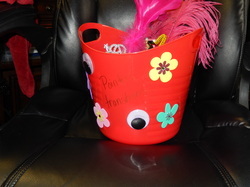 Pointers can and should be stored in different areas of the classroom. This is to be timely and efficient, so you don't have to run all over to grab a pointer. Pointers by the big books, at a center area.